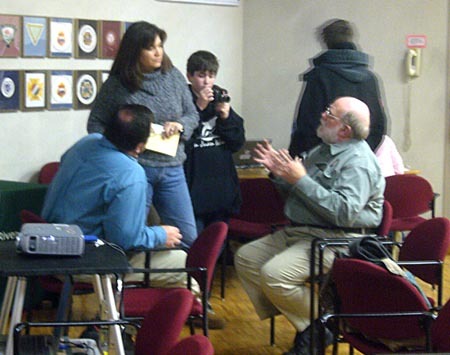 There are many versions of what happened at the Coldwater Spring/ Bureau of Mines open house on February 23. One of them is the official version which is the one that the National Park Service would like everyone to adopt and which they have spoon fed to a few reporters who may not have gone to the event. This official version is represented in the March 11, 2009 (St. Paul) Villager. This report by Kevin Driscoll says that people were milling about having an “electric” time talking with each other and talking with Park Service representatives, when “a group of activisits dominated the open house to argue that the land should be returned to the American Indians.” The article then goes on to quote liberally from Park Service representatives, but no one else. The who, what, how, or why of the protest is completely ignored. The basic, obvious, unreported fact about the protests at the open house was that these were Dakota people asking that the lands be given back to the Dakota, from which people permission to build a fort was obtained in the Treaty of 1805. Instead, the article quotes John Anfinson saying that “there was no one particular tribe represented.” This is a complete untruth, although be fair, some in the government do not perceive the existence of Indian people unless they are tribal officials. At the February 23, 2009, Coldwater Spring/ Bureau of Mines open house, Paul Labovitz of the Mississippi National River and Recreation Area (MNRRA) and Angela Waziyatawin listen while Steve Johnson of MNRRA gestures and explains something. Waziyatawin was one of those speaking that evening on behalf of Dakota ownership of the Bureau of Mines property. If newspapers are dying it one of the reasons is because they no longer serve the interests of the communities in which they operate. This insulting story is a perfect example. It is insulting not just because it ignores the protesters, but because it insults the truth and the right of its readers to know that truth. How does it serve the interests of the community to report only what government agencies have to say, without reference to dissenters? Anyone who has read these pages has a much better idea of what happened at the event than from reading the Villager article. Certainly there were good discussions going on prior to the speeches by Angela Waziyatawin, Sheldon Wolfchild, and others. And there were people in other groups at the meeting who resented what happened and wanted the small group discussions to continue. There were also a lot of differences of opinion about what should happen to Coldwater Spring. But those discussions continued after the speeches, including an extended conversation between Waziyatawin and Paul Labovitz and Steve Johnson of the National Park Service. This does not accord with the statement of one Park Service quoted as saying : “There was no dialogue. They didn’t want to listen.” The photo above of Waziyatawin listening to Steve Johnson of the Park Service suggests otherwise. In retrospect, the strategy backfired, but at least Park Service officials did a lot of learning that night, although apparently they do not remember much of what they learned. The article in the Villager is another example of how journalism has disappeared from the so called journalists of today. The person who wrote the article shows an obvious disregard for the profession. Thanks, Bruce, for pointing out the glaring inaccuracies in the report. My first take on the story was that it was just another racist response to seeing a bunch of Indians in a room. I think I’ll stick with my first reaction. It seemed pretty obvious that the writer had not actually attended the open house. Bruce suggests the National Park Service authored and authorized an “official” version of the events and the Highland Villager simply printed it. Actually, the National Park Service had about as much input into the article as Bruce did. The reporter did attend the meeting, despite what Bruce says, and did interview one ore more National Park Service employees. Who he chose to interview, or not, wasn’t within the control of the National Park Service. Bruce’s comments about the incompleteness of the article–its failure to show more than one side of the story–are correct. In addition, not all information in the news report was accurate and the National Park Service has asked the Highland villager to print a correction.